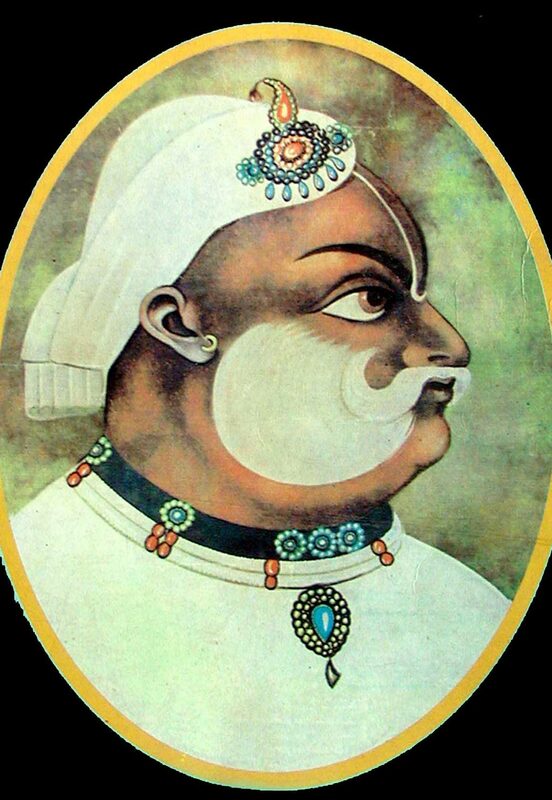 After Panipat war of 1761, Najib Khan Yousafzai, titled Najib-ud-daula, became the regent of Delhi. Najib's Baluch proteges formed a line of defence along the south-western frontier of his domain. The Baluch settlements were in the modern Rohtak district, -- such as Jhajhar, Bahadurgarh, Farrukhnagar and Tauru --- the petty Barons of which , as his brother-Muslims and fellow trans-Border men, clung to Najib for protection against the growing menace of Jat expansion through Mewat towards them. Nur-ud-din, Najlb's biographer, writes; "The parganahs of Hariana such as Gohana, Rohtak, Dadrri, etc -- came into Najib's possessions. The Baluch zamindars of that district became obedient to him." Musavi Khan Baluch, the lord of Farrukhnagar, led a contingent of over 2,000 of his clansmen , with whom he had joined Najib soon after the latter's entry into Delhi as regent. During the Panipat campaign he had aided the Afghan cause by closing the roads west of Delhi to the Marathas and cutting off their straggler convoys and couriers. The Maratha general from battle of Panipat, Antaji Manakeshwar, on his way home was killed by the Baluch zamindars of Farrukhnagar, as also was Baji Hari. The Baluch zamindars of Bahadurgarh and Farrukhnagar recognized Antaji Manakeshwar by his horse and dress as a chieftain and slew him. In November and December of 1763, we find Musavi Khan Baluch aiding Najib Khan in subduing the latter's refractory tenants in the Hansi-Hisar country. The Farrukhnagar principality was founded by Dalil Khan Baloch, surnamed Faujdar Khan in the time of Emperor Farrukhsiyar. He called his place Farrukhnagar after the Emperor, and populated it with his own people. His four eldest sons were killed in a battle, and he was succeeded by his youngest son, Kamgar Khan. Musavi Khan was son of Kamgar Khan. 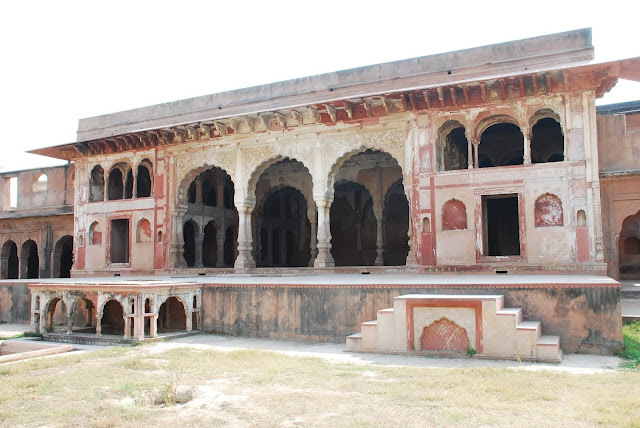 In the post-Panipat period, Suraj Mal Jat emerged as one of the most powerful and ambitious chiefs in the north. The absence of Najib-ud-Daula from Delhi owing to illness (May 1762) , enabled him to continue his policy of expansion. Suraj Mal occupied Agra on 12 June 1761 and extended his authority across the Jamuna as far as Bulandshahar. West of capital he engaged in creating a small separate state for his son Jawahir Singh covering Mewat and Baluch lordships near Rewari.For about ten years Jawahir Singh , had been engaged in destroying the power of the Mewatis. One of the Mewati chief, Sanwaliya, took refuge with Asadullah Khan Baloch zamindar of Tauru , who himself was attached to Musa Khan Baloch of Farrukhnagar. Sanwaliya carried on plundering and created much trouble in the Jat territories. He used to share his booty with Asadullah Khan Baloch as the price of protection. Jawahir Singh told his father, Suraj Mal ;" The Baluchis are giving shelter to Sanwalia. So long as i do not chastise them , they will not turn him out of their territory". Suraj Mal gave him permission to do as he liked. Jawahir Singh led an attack on the Baluch zamindar. Baluchs under Musavi Khan, opposed him. Taj Muhammad Khan Baluch arrived from Bahadurgarh to the help of Musavi Khan Baluch. In the ensuing encounter, Jawahir Singh, after an initial advantage, was eventually repulsed. This reverse exasperated him, and, he informed his father : "So long i do not exterminate the Baluches, i shall not rest". A second and stronger expedition was sent. Najib Khan wrote to Suraj Mal asking him not to touch the Baluchs who were his proteges. Suraj Mal replied that Baluchs deserve punishment, they have given protection to a highway robber in their home". Jawahir Singh advanced upon Farrukhnagar, wasting the villages on the way. Suraj Mal came up with reinforcements and a train of big guns, and in less than tow months the fort was taken (12 December 1763). Musavi Khan issued with his family on a promise of safety , but was arrested and confined. Meantime, on receiving an urgent appeal for the relief from the Balochs, Najib Khan had written against the Jat Rajah to withdraw from the Baluch estates, who were dependent on him and on the borders of his own dominions. 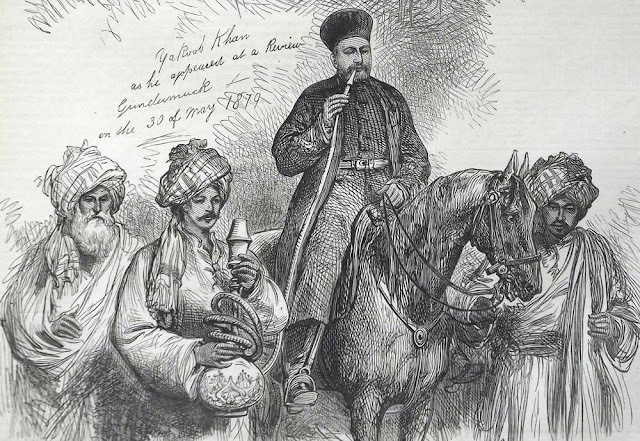 He himself was lying very ill at Najibabad , but set out for the scene of war , and reached Delhi on 14th December. But Farrukhnagar had fallen two days before, and all that Najib could do now was to write to Suraj Mal protesting against his unfriendly act in attacking the Rohilla chieftain's dependent, and adding, " Let what is past be past. You may keep the fort that you have captured. But it is not proper to hold Musavi Khan and his family in captivity. Suraj Mal declined and charged Najib Khan with harboring aggressive designs. He marched at the head of 30,000 strong army towards Delhi and arrived near the bank of river Hindaun. Najib with all his troops (below 10,000 men) took post on the west bank of Hindaun. Najib Khan had with him his brother Afzal Khan, son Zabita Khan, and nobles like Sa'adat Khan Afridi, Sadiq Muhammad Khan, Zaman Khan and Muhammad Khan Bangash. Keeping bulk of his army facing Najib, Suraj Mal marched away with 5,000 horse under his own command , crossed the Hinduan four miles upstream and tried to penetrate Najib's rear. A furious battle raged for some time , with charges and counter-charges. Suraj Mal himself with his personal staff , then rode forward to rally his shrinking men. But in crossing a nala left behind by the river, he fell into an Afghan ambuscade and was shot down with most of his companions by the Rohilla musketeers lying concealed in the Jhau bushes. The rest of that squadron broke and fled into the jungle, abandoning their horses to plunder. When the men of Najib Khan were pursuing the fleeing men , Sayyid Muhammad Khan Baluch (the brother of Musavi Khan Baluch) , nicknamed Saidoo, was also hotly engaged in pursuit. A Rohilla shouted to him ; "Where are you going Sayyid Muhammad Khan? Here is Suraj Mal lying. I can recognize him". Saidoo got off his horse. The Baluch, having been harassed by Suraj Mal, had become blood-thirsty and so he drew his knife and plunged it tow or three times deep into the abdomen of Suraj Mal. He ordered his light horsemen to cut off his head but his men gave so many blows at Suraj Mal's head that it was crushed into pieces. The Jat force facing Najib , still continued firing guns. When Saidoo Baluch came up and boasted that he had slain Suraj Mal, none would credit it , as the entire Jat army was holding its ground as firmly as before. Three hours after sunset , both armies fell back to their encampments. Next day, at dawn, the spies brought the report that no trace of the Jat army could be found for 30 miles. Najib asked for proof of Suraj Mal's death. Saidoo cut off an arm from the corpse of Suraj Mal and showed it to Najib Khan. 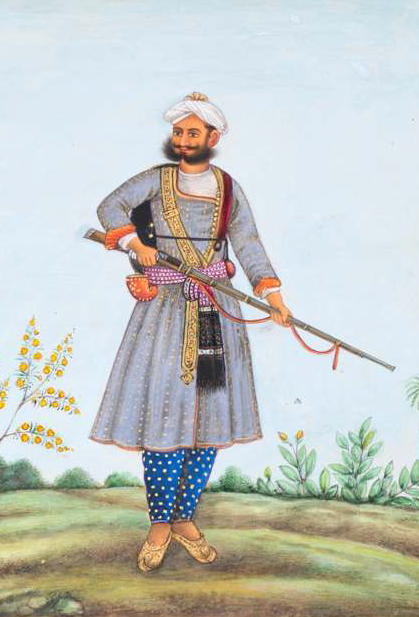 The Rohilla chief's envoys, who had visited Suraj Mal only a day before the battle, at once identified the body by the design of chintz cloth of his tunic and the mark of the amulet that the Jat Raja was known to have worn for years. Thus all became convinced that Suraj Mal had been slain. 2- "An Account of Najib-ud-Daula"
5- Imperial Gazetteer of India, v. 12, p. 73.